L to R: Dr. George Mitchell, CMO; Dr. Bev. Barnett, HCC Consultant; Hon. Nikolas Steele, Minister of Health and International Business, Grenada; Dr. Sonia Nixon, NCD Focal Point and Interim NCNCDC Chair. The collaboration between the Commonwealth Secretariat (COMSEC) and the Healthy Caribbean Coalition (HCC) aimed at establishing or strengthening National NCD Commissions in the Caribbean continued with a mission to Grenada 3-4 October 2016. As part of the technical cooperation (TC) being undertaken through this collaboration, HCC consultant Dr. Beverley Barnett visited the country to hold discussions with Ministry of Health officials and the Grenada National Chronic Non-communicable Disease Commission (NCNCDC), and provide guidance for enhancing the functioning of the Commission. The objectives of the mission also included determining future TC needs of the NCNCDC and obtaining feedback on the draft Framework for the Establishment and Strengthening of National NCD Commissions: Towards a More Effective Multisectoral Response to NCDs, Part II (the Implementation Framework, IF). The document A Civil Society Report on National NCD Commissions in the Caribbean: Towards a More Effective Multisectoral Response to NCDs, Part I and Part II of the two-part series were produced through the COMSEC-HCC NCD Commissions Strengthening Project. The Grenada Commission, established in 2010, has been meeting monthly and undertaking activities in fulfillment of its mandate to advise the Minister of Health on issues pertaining to NCD prevention and control, in the framework of the National NCD Strategic Plan. The NCNCDC was instrumental in the development of the NCD Strategic and Implementation Plan, which covers the period 2015-2020. An average of 13 Commissioners participated on each day of the mission, representing Health, Education, Agriculture, Food and Nutrition, Media, Trade Union, Disaster Management, the Grenada Cancer Society, the Grenada Chamber of Commerce, the Grenada National Organization of Women, and Faith-Based Organizations. They listened to a presentation on the purpose and objectives of the mission, and were reminded of the contents of Parts I and II of the document tramadol mentioned above. The Commissioners provided valuable feedback on the draft IF, drawing on the experiences of the NCNCDC, and commented on a draft of recommended profiles for the Chair and Members of NCD Commissions that HCC had disseminated previously. They emphasized the value of being able to network with, and learn from the experiences of, other NCD or Health and Wellness Commissions in the region. 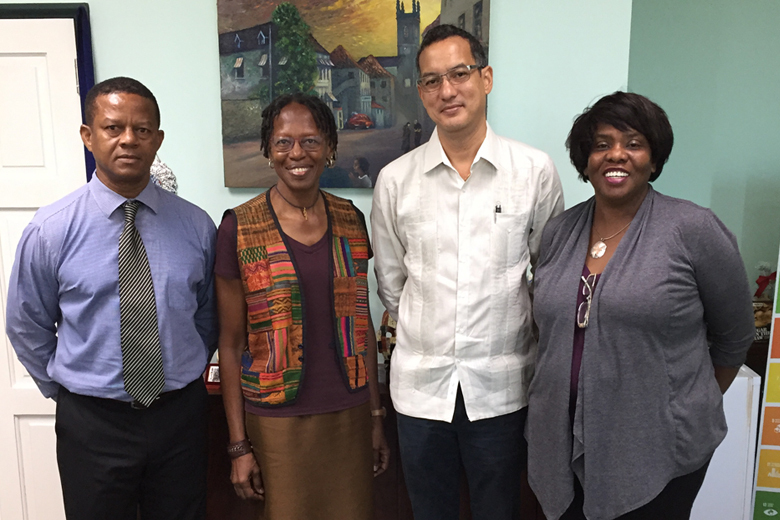 The consultant also met with the Minister of Health and International Business, the Honourable Nikolas Steele; the Permanent Secretary (Health), Ms. Lana McPhail; the Chief Medical Officer, Dr. George Mitchell; and the NCD Focal Point and Interim NCNCDC Chair, Dr. Sonia Nixon. The Minister encouraged the Commission to develop a strategic plan to guide its actions, and requested that priority be given to legislation addressing tobacco and sugar reduction, and to the development and implementation of a plan to mitigate the incidence of cervical cancer by preventing Human Papilloma Virus (HPV) infection. Having participated in the September 2016 meeting of the CARICOM Council for Human and Social Development (COHSOD) and noted the colour-coded chart of countries’ progress in addressing the Port of Spain Declaration on NCDs, the Minister expressed his wish to see all Grenada’s indicators “showing green”, demonstrating their achievement. As a result of the mission, the NCNCDC is likely to review its terms of reference and membership, and develop its strategic plan, among other actions. Technical cooperation will be useful in the formulation of the strategic plan, and for activities related to capacity building, research, and resource mobilization. It is anticipated that a new Commission Chair will be appointed in the near future, but the NCNCDC’s work continues under the Interim Chair, with the active participation of the members, whose commitment to the work of the Commission was evident during the mission. COMSEC and HCC will continue working NCD Commissions and other partners in the Caribbean to enhance the Commissions’ effective functioning.